"The bathroom was in bad condition -- leaking pipes, peeling floor, and exposed wires," Danny explained. "We re-did the master bath after realizing that we completely messed up the first time, when we started running out of money and needed to complete the project with poor materials and design." Most designers will say spend what you can afford and go after style that you can live with for a while. "When Eichlers were built, they didn't go to any great length to be extravagant in the design. That's why I always figure it's best to upgrade," James Fanning says. "Some people want to retain the original look, but I like custom bathrooms with newer fixtures, stainless steel accents, tile, and Corian or stone counters." Lourdes Garcia points out that many mid-century homeowners are interested in using sustainable materials and products wherever possible for their remodels. There are plenty of new 'green' products available in tile, flooring, and plumbing fixtures, such as water-conserving toilets. Earth tones are always a safe choice for surfaces, and good quality porcelain tile and stone are smart upgrades. Not only do they last a long time and are low-maintenance choices, they also recoup money at resale. Sue Olson also reminds homeowners that countertops don't have to be made of stone. "I've used a strong polyurethane coating on wood counters in the bath, and they last for years," she says. 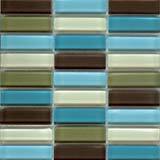 To add retro flair to a bath design, glass tiles are also a great way to introduce color to backsplashes and shower surrounds. 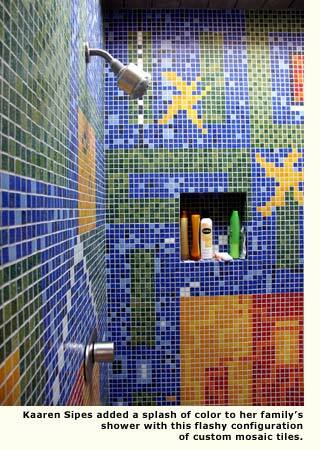 Kaaren Sipes and her family added color to their bath through a custom mosaic shower installation. 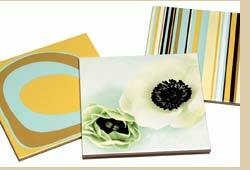 With the help of mosaictilearts.com, the family designed a pattern made of one-by-one-inch square glass tiles. "It's fun, and it's something interesting to look at every morning," Kaaren says. "We had a dog who died right before we moved into the house, and she liked to sleep on the shower floor. So we put a mosaic pattern of her on the bottom of our shower, so she's always with us." Lastly, ask the contractor or architect you hire to recommend good local sources for products. Their relationships will oftentimes bring a better price. Overall, a little bit of ingenuity and a lot of creativity can get you a safe, functional, and stylish bath that's well worth the effort. "Having the new bath really dramatically changed our day-to-day perception," admits Chris Connors. "The old shower was a little, well, dated and sketchy. In the old bath, I would get in and out of there as quickly as possible. 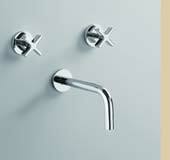 Now, with the new one, I look forward to showering in the mornings."